If the oil sands aren’t high carbon, why do oil sands proponents spend so much time fighting low carbon fuel standards? With the recent efforts by the Government of Alberta to initiate a clean energy dialogue with U.S. leaders, I’m beginning to question the logic of our Environment Minister. On paper, the minister’s objectives are “to have an open and progressive discussion about climate change, the energy choices we all make as consumers, and how we can work together for a cleaner energy future.” Yet, when it comes to low carbon fuel standards — a set of policies that could accomplish those very objectives — the conversation stops dead in its tracks. Low-carbon fuel standards, such as those adopted by California and being considered by several other jurisdictions, aim to decrease the greenhouse gas emissions associated with transportation by ensuring that the average life-cycle emission intensities of fuels sold in the region are limited to a certain level. According to this strategy, fuel providers may choose where they get their oil to avoid buying it from more greenhouse gas–intensive sources, such as the oil sands. The potential implications of a widely adopted low carbon fuel standard already has the Government of Alberta travelling across the U.S. to campaign against the standards. 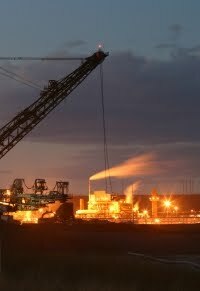 Members of the oil sands industry have also been fighting low carbon fuel standards. Some have established a lobby group for their cause. What’s confusing about the situation is that at the same time as they are fighting low carbon fuel standards, the oil sands industry is also heavily engaged in a campaign to convince the public that their greenhouse gas emissions are essentially no different from other crude oils. The Canadian Association of Petroleum Producers recently responded to protests against oil sands by arguing that life-cycle oil sands emissions are only marginally greater per barrel than the average crude entering the U.S. and that the difference between the two is getting smaller with time. If this is the case, why are industry and government fighting so hard to undermine performance standards? In my experience, there has been a lot of debate about the exact amount of greenhouse gases emitted during oil sands production and how they compare to an assortment of conventional crudes. Typically, proponents of oil sands development tend to play fast and loose with the facts and cherry pick studies that downplay the differences or that have limitations that need to be considered. Numbers aside, the oil sands industry really needs to get its story straight: Is oil sands crude only marginally more carbon intensive than other crude oils, in which case low carbon fuel standards should not represent a threat, or is it a carbon-intensive fuel source that needs to fight efforts to reduce greenhouse gas emissions in order to maintain access to markets?